The party never stops while at the Monster Products booth at CES. On top of being front and center to witness the Monster Takeover, this year we had the pleasure of meeting Peter Miller and finding out which of the Monster products are his personal favorites. Getting to know Peter was so much fun!! Sure, he's a producer, spokesperson, philanthropist, professional angler, three time World Sailfish Champion and host of Bass 2 Billfish with Peter Miller, but he's also such a blast to hang out with. We share his love of listening to good music on great speakers. Music makes such a difference in life, even when fishing. Not only to keep everybody inside the boat happy, but the fish also seem to respond better when there's a kickass bass boost in the mix (as in thump, not a new fish breed). 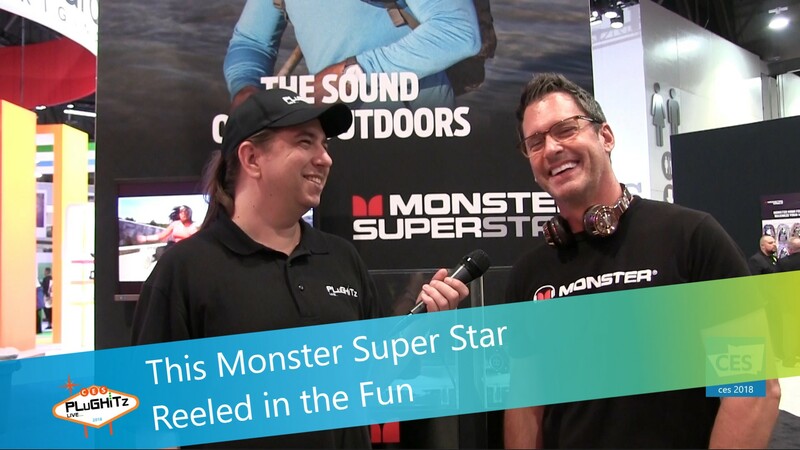 Just like us, he loves his Elements Headphones and Monster Blaster, but when asked to choose a favorite Monster product it was hands down the new S100-S400 SuperStar Series wireless speakers. There's a size and sound for every occasion. From attaching the S100 onto a backpack for they day's outing to getting the full dynamic sound from the S300s and S400s that will kick up any party, this line does not disappoint. And for somebody like Peter, the fact that they are wireless, fully waterproof, floating speakers with long life batteries that will keep up will all of his boating adventures, there's nothing better. Take a look at the full line of Monster Products here and let us know below in the comments section which ones are your favorite.